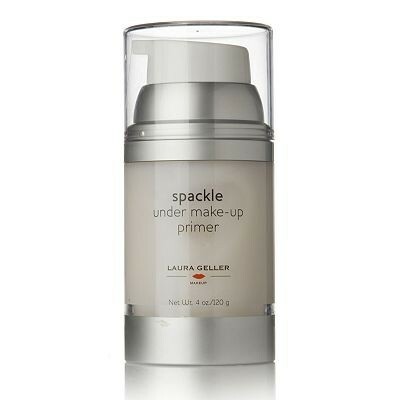 Spackle Makeup Primer from Laura Geller. This versatile primer is contains natural plant extracts including aloe vera, and it's oil-free which makes it suitable for all skin types. Help your cosmetics last longer and give your complexion a gorgeously dewy finish with this Spackle Makeup Primer. Then, apply a small amount of Spackle over the entire facial area and under the eye area. Feels cooling, soothing and soft. Makes make up last longer and gives an even base to work with. Can be seen as expensive, but I have tried lots of primers and this one is much better than most. A lovely light texture that glides over the skin, it doesn't leave your skin dry or greasy it just creates an even base for your make up to sit on to stop it sinking into fine lines or open pores. I have found that my make up lasts a lot longer with this primer it doesn't slide of, flake or roll which I have found with other primers that as soon as I touch my face it just seems to want to come of as if it was like a film on my skin, this primer seems to gel with your foundation and lock onto it. Sometimes primers can feel claustrophobic, you want to get them off feeling like your skin cant breathe, there is none of that with this product. I buy this from QVC as it is usually cheaper than anywhere else, and as much as I like this primer, I LOVE the Laura Geller Eye Spackle, it is one of the best products, ever. I have tried my fair share of primers and this is by far the best yet. This is great as it sinks in after about a minute and leaves you with a smooth base for make up, it hold's the make up in place almost all day, which for me is somewhat of a miracle as I have very oily skin! Yes, it is pricey but it lasts a long time and I feel it is definitely worth the money. Like all the Laura Geller products I have tried this is another winner for me. Great for your skin and effective too. It does make a difference when using this under a foundation. It gives a lasting smoother finish. Easy to use. Did not feel heavy and cakey. A great primer that helps your make-up last longer. Gives a great base for your make-up. Easy to use. Good for the skin. This is the first ever primer I have used properly, so I suppose I have nothing to base it on. The thought of primer normally makes me think of a skin which cannot breath...the thought of another layer doesn't sit well with me in general. However, this primer is lovely. It glides onto the face easily, it doesn't leave any shine or grease. I tend to wait a few minutes before I start applying my make-up...just so it will absorb properly. I really do love it, even at the end of the night when I remove my make up I can feel it coming off...that's staying power if I ever did see it! Easy to use pump carton. Works well & lasts long. The price as there are cheaper ones available. Spackle - Under Make-Up Primer - great feel, great staying power!